Abeyta Nelson Injury Law recovered $2.5 million for a client seriously injured in a truck accident at his Lower Yakima Valley workplace. On a typical work day morning, our client, a young farm worker, was driving from his home in the Lower Yakima Valley to the farm where he had worked for the past 10 years. As he approached the farm, our client stopped his vehicle, waiting to turn into his place of work. Suddenly, his vehicle was struck by a large semi-tractor trailer owned by his employer. 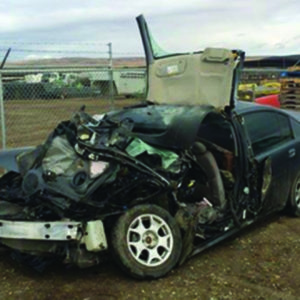 The truck accident destroyed our client’s vehicle and trapped him inside, requiring emergency personnel to use the “jaws-of-life” to free him from the vehicle. The worker’s hips and lower legs were badly injured. After initially being treated in the emergency department at Yakima Valley Memorial Hospital, he was airlifted to Harborview Medical Center in Seattle. Our client underwent multiple surgeries to put rods in his legs and screws in his hip. He was at Harborview for 25 days before being transferred to a rehabilitation facility for an additional month of care. Our client’s medical treatment and recovery lasted over two years. While he will never have full use of his legs as he did before, he is now able to walk with the assistance of a cane. Usually, when a person is injured on the job, the injured person cannot file a personal injury claim against his or her employer and is limited to filing a worker’s compensation claim with the Department of Labor and Industries. In this situation, the injured worker was told he had no personal injury claim for his injuries since the truck accident occurred while he was working. In addition, he was also told by his employer that his only option was to file an injury claim with the Department of Labor and Industries. Abeyta Nelson Injury Law, where attorneys talked with him and determined he did have a claim for personal injuries due to his serious truck accident. Under Washington law, in most cases when a worker is injured while traveling to and from work, or injured in his employer’s parking lot, the worker is not considered on the job. Thus, in this case the injured worker could bring a claim for personal injury against his employer because he was not on the job at the time of the truck accident. Since our client’s damages ended up not being limited like they would have under the Workers’ Compensation System, we were able to recover $2.5 million for him. This settlement allowed our client to pay all his medical bills and set up future wage loss payments for the remainder of his life so he can continue to take care of his family and medical needs. It’s critical to know your rights before making any important decision on your personal injury case! If you or someone you know has questions about a similar case, or any truck accident, contact Abeyta Nelson Injury Law for a free consultation.